When her Mohawk mother died, Catherine Stand Apart went to live with her French father Gabriel Duval near Montreal. Her sister Bright Star and their little brother Joseph stayed behind and, inevitably, part of Catherine’s heart did too. But she had made her choice; her father needed her. Now, in 1759 Catherine ran his trading post even though she could not seem to reach his heart. All her life, Catherine tried to live neutrally between two worlds—between her divorcing parents, her Mohawk and French background, and now, during the Seven Years’ War, between the French and the English. But it was not to remain that way. Her ex-fiance, British Samuel Crane, once again her father’s prisoner, claimed to have a plan to bring peace and end the famine in New France, and he needed Catherine’s help. In the meantime, his very presence broke her heart. From trading post to Mohawk village, in towns, fields, rivers, and battlegrounds, with all the furs, canoes, militia, rum, ever-present hunger, and death, Catherine’s story shows us New France. It also shows us her family, various tribes, and the British, all human and so similar despite the turmoil between them. And it shows us Catherine herself, a remarkable and thoroughly recognizable woman. What’s more, it left me holding my breath as I raced through the pages, alternating between hope and dread, unable to guess the end. This is a story of sadness, betrayal, and loss. War always brings those, and there is war aplenty in in Between Two Shores. It is also a story of loyalty, love, and forgiveness, based on the gospel. It is about people, some growing and changing, others hopelessly stuck in their ways. This is not a pretty little love story nor an action story with the bravest winning, but real life, with time, chance, and revenge happening to all. Even more than that, it is a story of hope, because God adopts us even more thoroughly than Mohawk families adopt replacements for their dead. We are loved eagerly and completely, not because of anything we have done, but because Jesus died for us. Historical notes show that the most unlikely events in the novel are actually based on reality. In fact, Between Two Shores is detailed enough that one could follow some of the events with a map and tiny toy soldiers. Despite the historical accuracy, it never gets boring. I am in awe of author Jocelyn Green’s ability to weave implausible reality into such a realistic novel full of history, action, emotion, and faith. 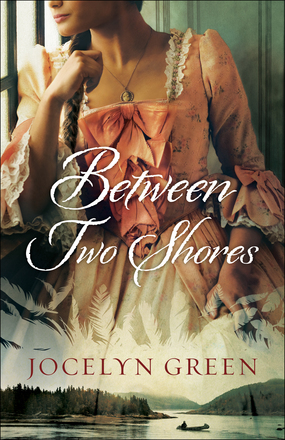 I highly recommend Between Two Shores to anyone looking for a stirring historical novel. Also, it could be part of an upper high school study of New France, the Mohawks, the Seven Years’ War, and related topics. If your family likes to study history through literature, this is a good choice. If you enjoyed this review, you might want to connect with me on GoodReads where I eventually share what I read, or friend me on Facebook where I occasionally show up. Posted in: 52 Books in 52 Weeks, Canadian, Reviews, Reviews: Fiction.